Back in May I posted a Lush haul on my blog that included the purchase of a shampoo bar and solid conditioner. I'd developed a horrible greasy patch on the back section of my hair that didn't seem to wash away so I decided I wanted to try a more 'natural' product to see if that would rid me of the grease. 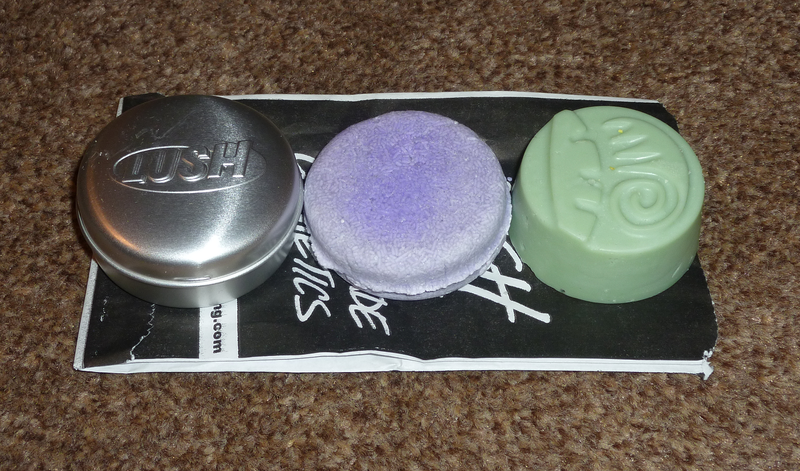 I'd done a little research before entering a Lush store so I already knew that their Jumping Juniper shampoo bar was the one targetted at oily hair. The key sebum-banishing ingredients in this are rosemary, lavender and various oils including juniperberry, lemon and lime. I didn't intend to come out with a conditioner but I thought what's the point of continuing to use one full of harsh chemicals when I'm trying to change my shampoo so I bought the Jungle Solid Conditioner. The softening ingredients in this product include cocoa butter, avocado and banana. I was so glad I bought this combination of products as they left my hair feeling really clean but still hydrated. The dreaded greasy patch was gone after one wash and they gave a lovely herbal scent to my hair that lasted for hours too. As well as the greasy patch, I already had oily hair that I need to wash every day and these products kept my hair clean for longer. I didn't stop washing my hair daily but I really could tell the difference in my hair so I definitely recommend these products if you are looking for products that allow you to wash your hair less frequently. The conditioner isn't the most nourishing one I've ever used but it gave the right level of hydration to my fine hair without weighing it down. I normally get quite an itchy, irritated scalp and end up having to use Head & Shoulders a few times a week between other shampoos to calm my scalp down but when using these products my head has been itch free without using my trusty H&S! These products are pretty long lasting as you only need to rub them on wet hair a few times to create a lather or condition the hair. After two months I still have a few tiny pieces of my shampoo and conditioner bars left but they would have lasted even longer had I not moved to a different flat. What I mean by this is, you need somewhere dry to store them otherwise they decrease in size due to staying wet. If you have a large shower cubicle or a shower over the bath, it's easy to keep them dry. Now that I have a tiny cubicle with no shelf to put anything on, the bars stay under the water flow constantly washing them away :( I did buy a shampoo tin to keep the shampoo bar in for this reason but I don't really like the design of it as the soap doesn't really fit in properly so I ended up using a soap dish which did the job just fine (when you have somewhere dry to store it!). I would definitely repurchase these products and I think I would quite like to try another shampoo bar so if anyone has any recommendations please let me know. I've never heard of shampoo and conitioner in a bar form. They sound aweseome. I might have to have a look at my store. I just got 2 bars in the mail. I've only ever used Paul Mitchell Two clarifying shampoo which did nothing for me. So I'm hoping to see some results here. Just one extra day of clean-feeling hair would be great, especially with long wavy/curly hair.